A paint device for rendering to a raster image. A WRasterImage paint device provides support for creating raster images (such as PNG or GIF images). 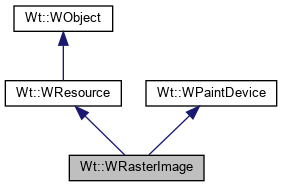 When used either in conjunction with a WPainter, it supports vector graphics operations, and can be used to make a PNG or GIF version of a WPaintedWidget's contents. It also provides a low-level API to color individual pixels using setPixel(), which directly sets the raster pixels. On Linux, the rendering is provided by GraphicsMagick, and this class is included in the library only if libgraphicsmagick was found during the build of the library. As an alternative, Wt supports certain versions of skia. In general skia is a good and performant renderer, but since it does not have releases, and a not very stable API, we don't recommend it. On Windows, Direct2D is used for rendering, which means that no extra dependencies have to be installed. If Wt is built to use libpango for font support, then text rendering is done using this library. On Windows, DirectWrite is used for font support functions. In other cases, you may want to configure TrueType font search directories using addFontCollection(). You can use the image as a resource and specialize handleRequest() to paint the contents on the fly. Alternatively can also use write() to serialize to an image file (std::ostream). drop shadows are (not yet?) supported. type indicates an image type. The mime type of the resource is "image/" type. If Wt has been configured to use libpango, then font matching and character selection is done by libpango, which is seeded with information on installed fonts by fontconfig. In that case, invocations for this method is ignored. If Wt has not been configured to use libpango, then this method may be used to indicate the location of true type fonts. The main drawback compared to libpango is that font selection is not steered by the need for particular characters, i.e. font selection is independent from the text's need for specific characters. Most truetype fonts provided only partial unicode support. The provided directory will be searched for fonts (currently only TrueType ".ttf" or ".ttc" fonts). Fills the image with a white background, or transparent if possible. Use this method to directly get the color for an individual pixel, when using the paint device without a painter. This is a more efficient alternative than calling getPixel() for every pixel. Parameter data must point to an allocated memory region of width*height 32-bit words. The pixels will be written in row-order from top-left to bottom-right, in RGBA format. Use this method to directly set colors for individual pixels, when using the paint device without a painter.